Intel's annual IDF techfest kicked off today in San Francisco with head honcho Paul Otellini making bullish predictions for both Intel and the broader PC industry. Otellini says PC sales will likely buck the general recessionary trend that has seen motor manufacturers and consumer electronics outfits suffer in 2009. Even better, he reckons, 2010 will see a return to significant growth. Cast your mind back to IDF 2008 and you'll remember the theme was visual computing. 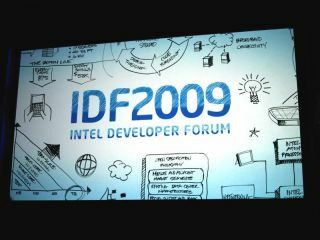 This year, Intel hasn't come up with quite such a catchy concept, but the general gist for IDF 2009 is a shift in focus from "the personal computer to personal computing". If that sounds a little wishy washy, the underlying idea is Intel's quest to drive its x86 processor architecture into literally all aspects of human life. Numero uno on the long hitlist of new device types for Intel is the smartphone. To that end, Otellini confirmed the Atom ultra-mobile roadmap was fit and healthy with the Moorestown platform due to arrive in mid 2010 and bring with it a 50x reduction in idle power consumption. However, it's likely Intel won't be ready for a full on assault on the smartphone market until Atom goes 32nm with Medfield 2011. Among the hundreds of further embedded applications Atom is rapidly assimilating, Otellini said, is in-car infotainment. We've known for a while the Atom chip was due to make it into cars, but now we have some firm information. It will appear in a wide range of BMW and Mercedes-Benz models from 2012 onwards. But perhaps the most impressive part of Otellini's keynote was a brief glimpse of the Moblin 2.1 operating system for handhelds. The slick interface looks extremely plausible running a wide range of applications including various messaging and communications formats, social networking, third-party applications and web browser. Best of all was the seamless multitasking and general polish and consistency of the user interface. It may be a familiar refrain, but Atom-powered Moblin 2.1 has all the makings of an iPhone killer. While we're talking iPhone, Otellini also announced plans to develop an app store for Atom-powered handhelds. Details remain sketchy save for the participation of Acer, Asus and Dell. But you don't need us to tell you which fruit-themed company is the target here. Otellini also confirmed Intel was on track with both its imminent 32nm Westmere family of chips and the even finer 22nm silicon node for late 2011. To prove the latter, Otellini unsheathed a wafer composed of the very first functional 22nm SRAM cells. In other words, as the rest of the world economy smolders, it's business as usual for the mighty Intel. And it's only going to get better as the economy recovers. As Otellini insinuated, the PC is now so indispensable it's proving almost immune to the worst global recession for over 70 years. Stay tuned for more as we tour the sights and sounds at IDF.